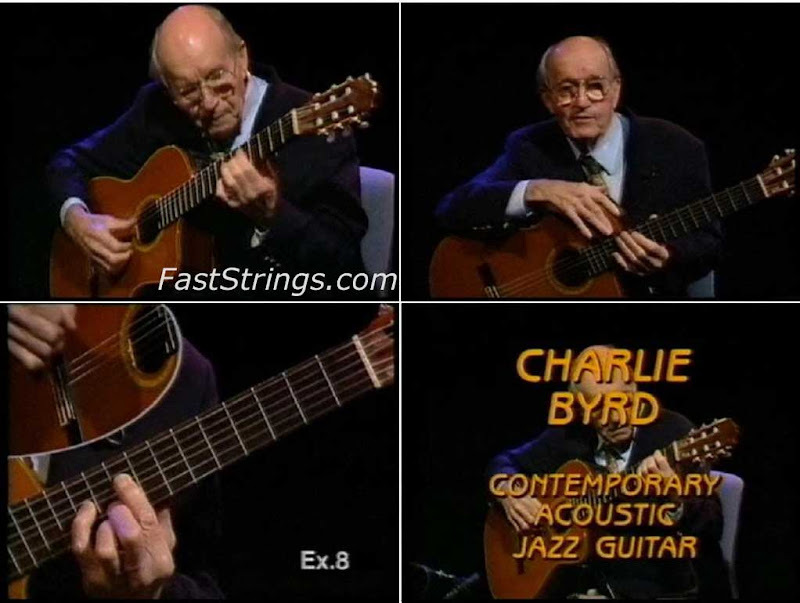 Charlie Byrd Contemporary Acoustic Jazz Guitar free download. Charlie is generally recognized as the founding father of nylon string jazz guitar. He was one of the original Great Guitars that recorded on Concord (along with Herb Ellis and Barney Kessel) and is an “elder statesman” of the instrument. This video is full of Charlie doing what made him famous. Taking his time, he begins with a discussion of general classical-style technique, hammers and pulloffs, trills, and right hand fingerstyle warmups. The examples are liberally sprinkled with lovely chordal passages and licks. Other subjects that Charlie covers include blues playing, chromatic substitutions in turnarounds, artificial harmonics and a special section on Bossa Nova rhythms. He plays all the examples with impeccable classical technique and a gentle, engaging swing feel. I would have preferred more playing than talking, but others may find his detailed verbal explanations useful. I think this video is especially valuable for classical players interested in learning to play jazz but don’t want to buy an electric guitar. You can do it on a classical guitar and Charlie shows you how. It’s also useful for regular jazz players who want a good introduction to fingerstyle guitar. Charlie’s right hand fingerstrokes exemplify proper technique, making this video a valuable learning tool. If all you want is a good basic jazz guitar video, you might want to check out the Jimmy Bruno or Joe Pass titles. But if you’re a classical player interested in jazz or a jazz player interested in fingerstyle, this is the video for you. Also included PDF book: Charlie Byrd’s Melodic Method for Guitar, year 1973, Pages 97, language – English. But included another guitar method also by Charlie byrd, but not the booklet of the DVD.